Imagine a place nestled among the Arizona mountains where you'll see spectacular desert sunsets and majestic Saguaro cactus right before your eyes. Villas of Gold Canyon is just the place you want to be to experience the true majesty of the Arizona desert, combined with a brilliant golf escape. Golfers are not the only ones who will enjoy time spent in the area when you buy Arizona timeshare resales. 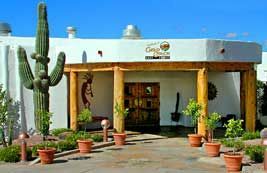 Everyone will enjoy activities like fishing, boating, biking, horseback riding, bird watching, visiting ghost towns, trips to the Tonto National Forest and seeing historic Indian ruins. Out of Africa Wildlife Park is where you'll have close encounters with thrilling African wildlife, in the middle of Arizona! Visits to Dolly Steamboat at Canyon Lake let you embark on fun themed cruises and Copper Spike Train Excursions let you immerse yourself in early Western life. Your new timeshare at Villas of Gold Canyon near the Superstition Mountains makes everyone feel welcome with spacious suites featuring cozy fireplaces, kitchens with niceties like a two burner stove, microwave, toaster, utensils and cookware, a full size refrigerator and dining table. Everyone will appreciate thoughtful touches like ceiling fans, cable TV and wireless Internet. Enjoy indoor and outdoor swimming pools, whirlpool spa, golf on several excellent golf courses, a playground, restaurant, an exercise room, tennis and racquetball courts and convenient laundry facilities. A nearby grocery and convenience store also comes in handy for little items you might need. Once you buy one of these Arizona timeshare resales, you've made a terrific lifestyle investment in family fun, bonding and adventures. These are the things children will remember once they've grown up and moved away. 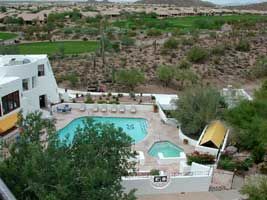 Staying at Villas of Gold Canyon provides breathtaking sightseeing opportunities. Photographic opportunities abound with some of the most breathtaking desert and mountain scenery found in Arizona. Brilliant orange rock formations reaching for the sky dazzle and thrill every Arizona visitor. Historic Indian ruins excite everyone and provide a history lesson along the way. Contact Villas of Gold Canyon Specialist Today!